HTC JetStream. Photo from Engadget / All rights reserved. The new HTC JetStream / Puccini has some leaked photos now. 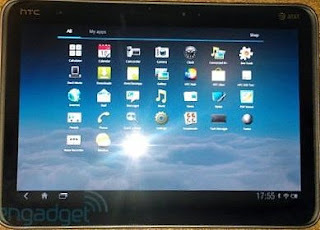 According to Engadget, it has Honeycomb 3.2 on board, as well as 1.5GHz dual core. 1GB RAM and 16 or 32GB storage memory is needed for it's Sense UI. A 8MP camera on the back of the 10.1" device makes it complete. Wow, Honeycomb with Sense UI. I can't even think about it. But it was inevitable, and might give this tablet a special feeling for sure, and will have some eye-candy. The look of the device itself, isn't quite spectacular. I'm still waiting for a little push in terms of the design. This all looks the same. How about something different?